When it comes to back pain, many factors may play a part in its presence. Back pain that isn’t caused by other underlying conditions such as scoliosis, inflammatory diseases (osteoarthritis, disc maladies, etc.) is many times the result of bad posture or body positioning. This issue cannot be corrected overnight because it didn’t happen overnight. The correction of poor posture starts with awareness. Start paying attention to how you walk, sit, and stand. The shoulders should be positioned over the hips, hips over knees, and knees over ankles. The shoulders should not round, they should be down and back but in line with the ears. The chest should not be collapsed and the tailbone should be positioned down. Many people have an anterior tilt which can cause overarching of the spine and the tailbone to tilt. Correcting this problem allows the spine to decompress and relieve some pressure. Starting Position: Stand against a wall with your back flat against it. Eyes forward, chin parallel to the floor, and align your body as mentioned before. Engage your core or abdominal muscles. Tilt your pelvis forward, and then tilt it back. As you tilt forward your back may come from against the wall slightly. Engage your core to stabilize yourself. Our pelvis is like a bowl, imagine water in your bowl, as you tilt forward a little water spills out and as you tilt back you are holding water in the bowl. Starting Position: Lay in a supine position on the floor or a mat. Keep upper back flat on the floor and abdominals engaged. Bend knees toward your chest with arms out to your sides. Let both knees fall to your right side towards the floor, chest facing towards ceiling. Hold this position for 5 to 10 breaths a few times. Minyette’s Tip: If you find your knees don’t touch the floor, place a pillow, bolster, or yoga block under your knees for support. Starting Position: Begin on all fours. Your knees will be directly under your hips, and wrists directly under your shoulders. Bring your hips down and back towards your heels. As you bring your head down reach your arms and hands forward across the floor until a stretch is felt. Hold for 5-20 breaths or 30 seconds to a minute and repeat a few times. Minyette’s Tip: This stretch can be done with wide knees which will allow the spine to stay flatter or with knees together which rounds the back more. Try both to see which one gives you the relief you need. 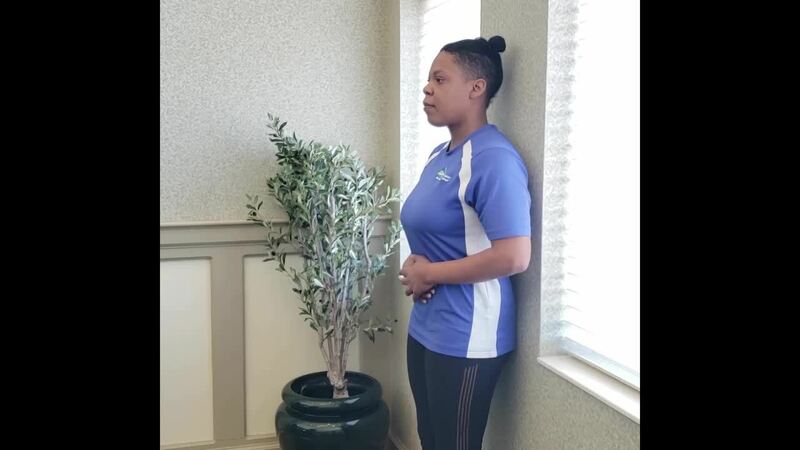 Wellness Specialists like Minyette, are expertly trained to develop workout routines and exercises that are personalized to your goals. The Twin Towers fitness center, The Connection, offers a variety of classes and equipment specifically designed for those aged 50+. The Aquatic Center includes a 75-foot heated pool, aquatic bikes, and a whirlpool. Our fitness center is open to the community and memberships are available. For more information on The Connection or Twin Towers, contact us online or give us a call at 513-853-2000.